The sun was still trying to inch its way up into the sky as it I got back to the car from last night’s camp, and such was the direction I was headed in that I found myself driving almost head-on into the sun for most of the drive. Irritating but a positive sign for the day as a whole. I arrived in Berwick and dumped the car in the station car park, taking advantage of the fact that a short ride on the train would neatly return me here at the other end of the day. The persistent cold of last night was replaced by the frustration of being alternately too cold and too warm. It took me a while to get the balance right, and after the initial warm up at the start of the walk I just about got by for most of the day with my Paramo Velez Adventure Light over a merino base layer. Side zips done up when up a hill, undone in the valley. A big, territorial, dog serenaded me from the other side of a, thankfully, high fence, and I left Berwick across fields to return me to the Wealdway proper. A final pause to get my temperature right and a crossing of the railway brought me to a more open area I’d considered for last night’s camp. Luckily, I’d not had enough time to get there before dark and consequently enjoyed the shelter of a wood from the biting north wind. No such shelter in the field I’d passed up. It would have been cold and a bit bleak. I was happy I’d made the choice I did. 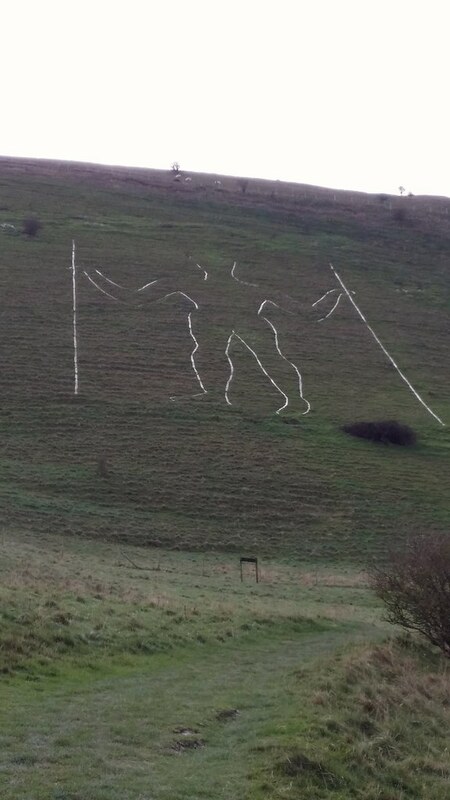 I walked out of Wilmington and the Long Man was in front of me, although not easy to see with the sun in my eyes. A closer inspection was called for. I passed Wilmington Priory and took the little path screened off from the road by a line of bushes. Unfortunately I’d got a fair way down it before I realised it was being used as a mass toilet by a crowd of Russians. They also weren’t very good at getting out of the way. 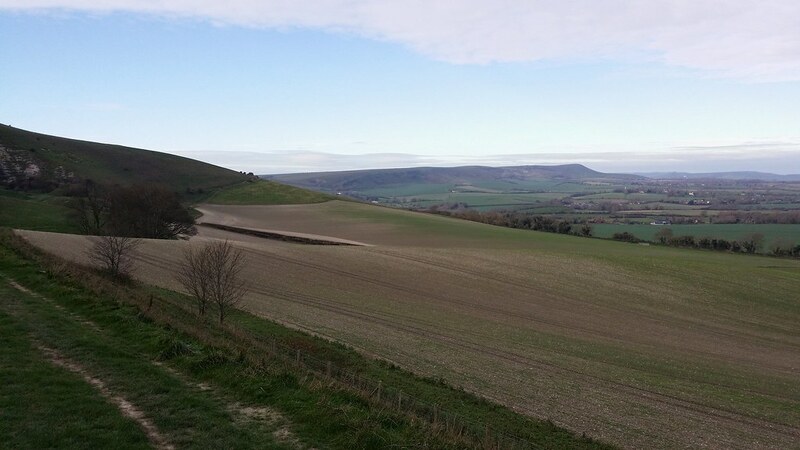 Anyway, it wasn’t long before I was stood just below the Long Man and deciding my next move. Basically it was a decision as to whether to climb the hill and claim a Marilyn or stick rigidly to the Wealdway itself. In the end I decided to tackle the ascent but to come straight down the next ridge so that I didn’t miss out too much of the path. Miraculously I managed the ascent in one push without stopping, finding the consistent straight slope of the slanting path a big help. Near the top a gliding club were playing with their little planes. 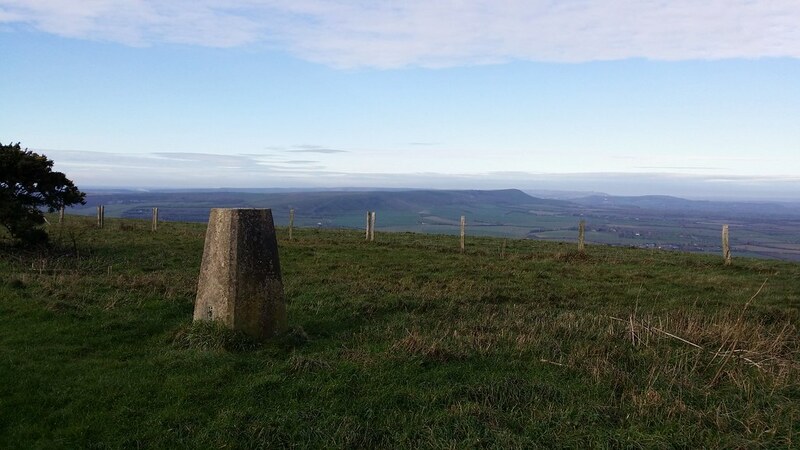 I reached the top and visited the tumulus marking the summit as well as the trig point a few metres away. 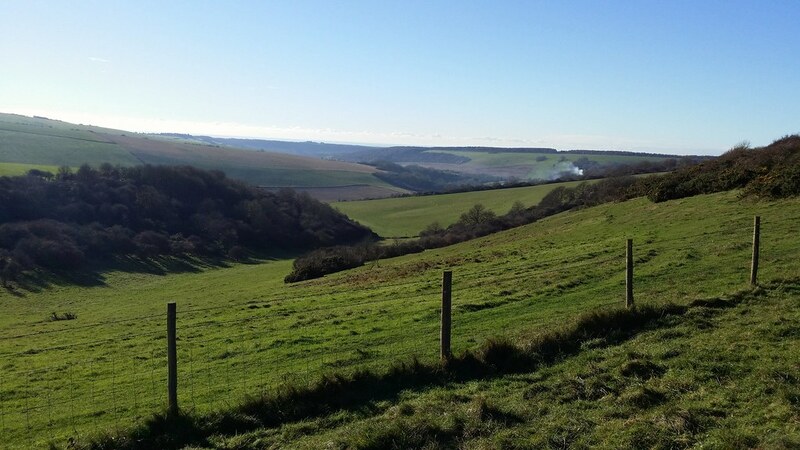 Down the north east ridge to The Holt, finding the last steep bit of the descent a challenge on wet chalk, so that it was a relief to regain the Wealdway. 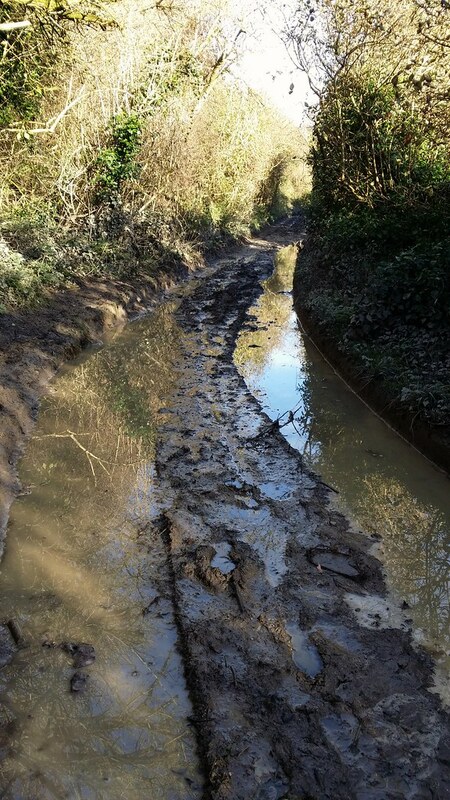 Now followed a few miles of byway – wide and heavily rutted in places, but great for getting miles under my belt. 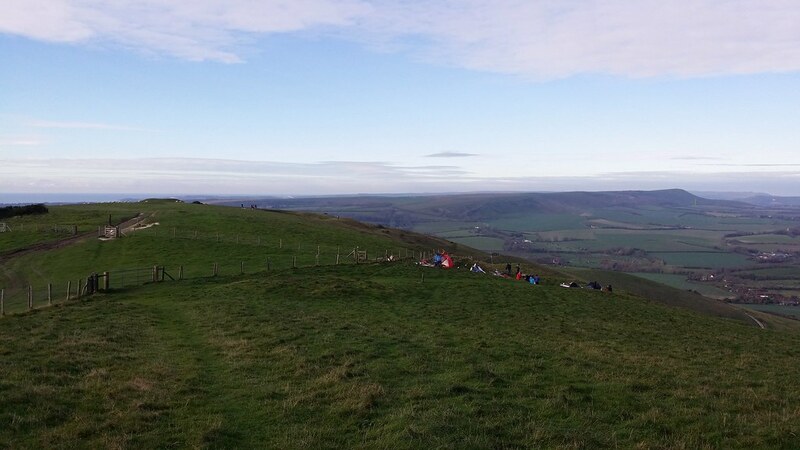 I climbed out of Jevington on another nice easy ascent – a long gentle drag up Combe Hill. 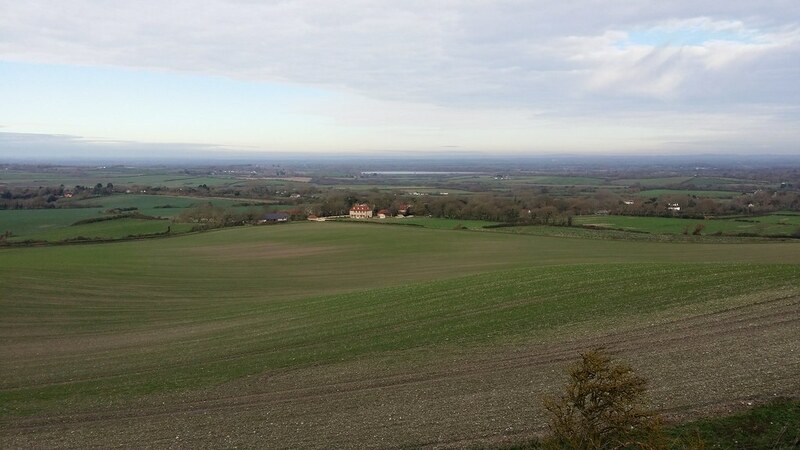 Unfortunately I followed the waymarking for the Wealdway, which meant I bypassed the top and by the time I realised what was happening, I decided that on a day of a 15 mile walk after a month of not much exercise, I could afford to let that one pass. 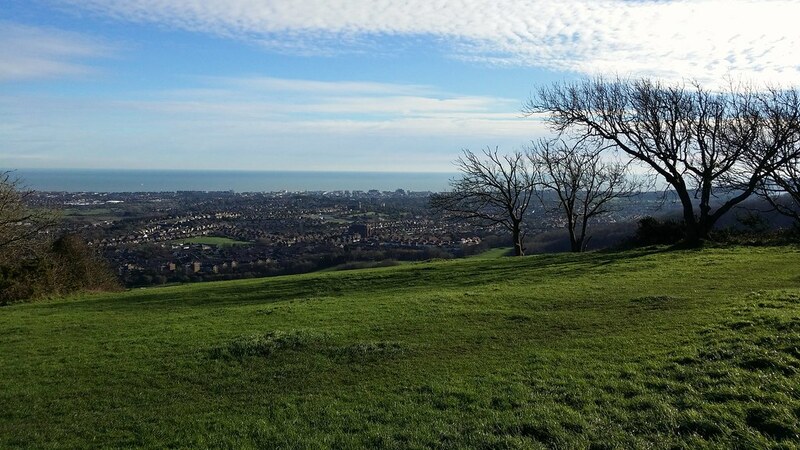 Willingdon Hill marked the point where I could sense the end of the walk even though I was only just over half way – Eastbourne sprawled out below me offering an easy shortcut or bail out if I so wished. This temptation stayed with me for a few more miles, and I’m sure it was no coincidence that this was the time my legs started to complain, as if they could sense the alternative on offer. Not used to wearing high ankle boots, I’d decided to try out my bargain Salomon Quest 4Ds from my local Blacks’ closing down sale, before I let them loose on winter on Dartmoor. Sadly, I hadn’t got the lacing quite right and was feeling pain just above both ankles. It brought home, though, just how used I have got to wearing trail shoes almost all year round. 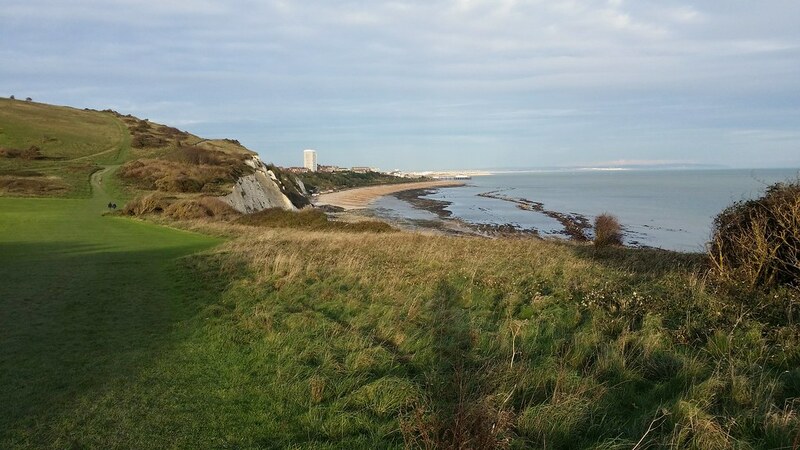 I hobbled on my way to the point one version of the South Downs Way broke off to head into Eastbourne, and somehow managed to make my legs carry on. 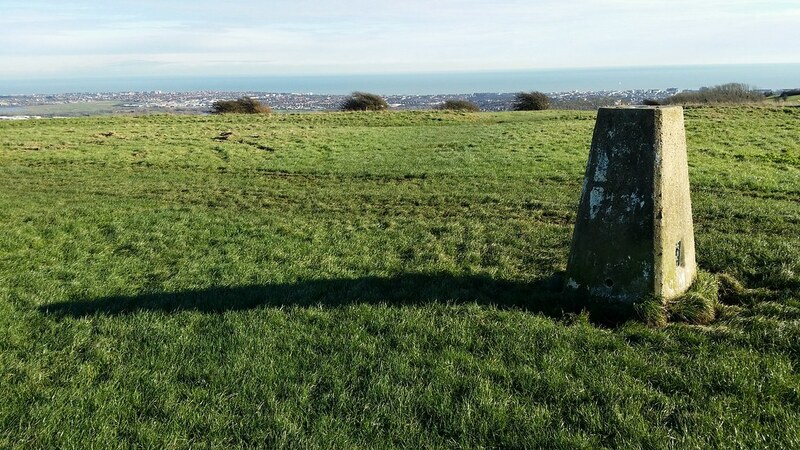 A grassy walk parallel to the road brought me to Beachy Head and the symbolic end of the walk. I dithered a while, knowing I still had another 3 miles to go. 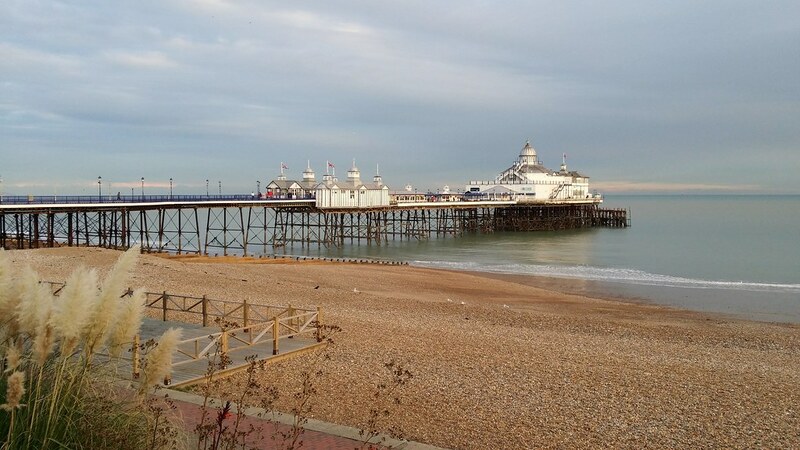 A steep descent to the path below the cliffs and then it was just a matter of a more or less level walk into Eastbourne and the finish at the pier.